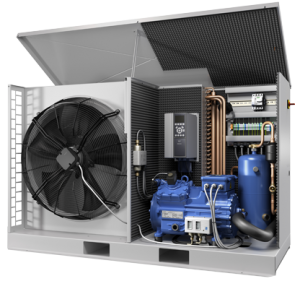 Whatever your application, from mobile air-conditioning, to off-shore platform cooling we've got it covered. 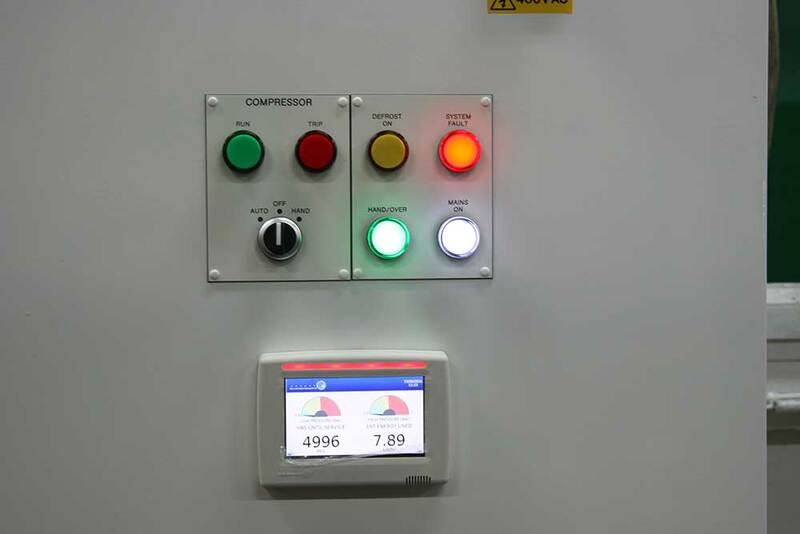 We are able to develop a leading edge strategy for your process control or SCADA application. Data management, system monitoring, system control over TCP/IP (over the Internet) is standard with all of our solutions. Now you can override, change control parameters, analogue settings on your application from anywhere in the world using just an Internet browser connected to the WWW. 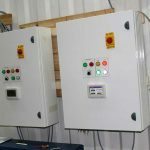 The system can be configured to send an email to a system manager, or technician in the event of a system alarm being raised. Real time monitoring and remote control from any standard PC anywhere on the planet. 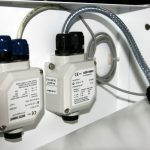 Data can be collated from a number of sources, including: thermocouples, pressure transducers, energy meters, flow sensors, liquid level-sensors and more. The connection can be either hard wired, or sent over ZigBeeTM wireless network, or networked over TCP/IP. We write custom software to control your application, we can then assign various parameters to be available remotely to any user who is authorised to log into the system. Data can then be monitored and controlled in real time over TCP/IP via the Internet using a standard web browser. The control strategy will be optimised to save energy and this will be reflected in reduced energy bills and lower C02 emissions. 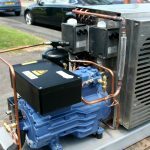 The system can be used in conjunction with other energy efficient products, to develop a system that may meet the criteria for the UK Gonvernments Energy Capital Allowance scheme (ECA). 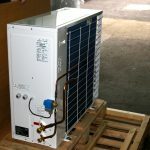 Here a company may offset the installation costs of certain ECA eligible energy efficient products and systems against their corporate tax bill. 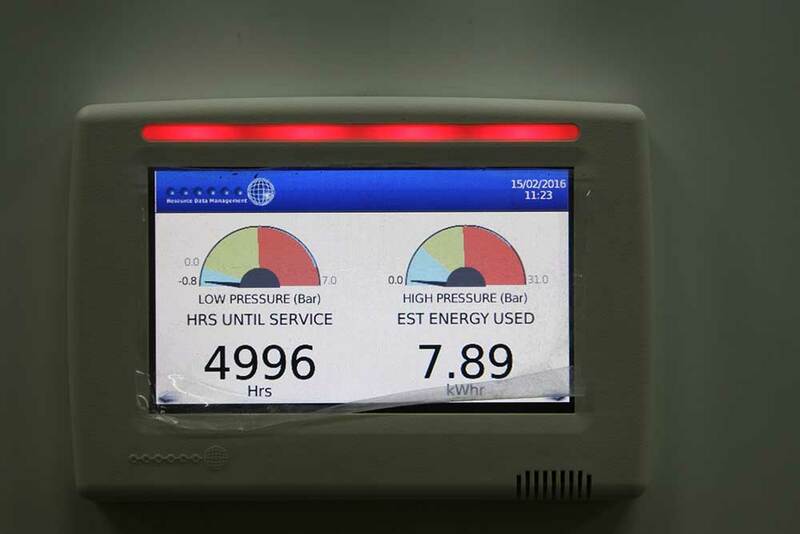 (SCADA) remote system control & data acquisition is the future of cutting-edge refrigeration system design. 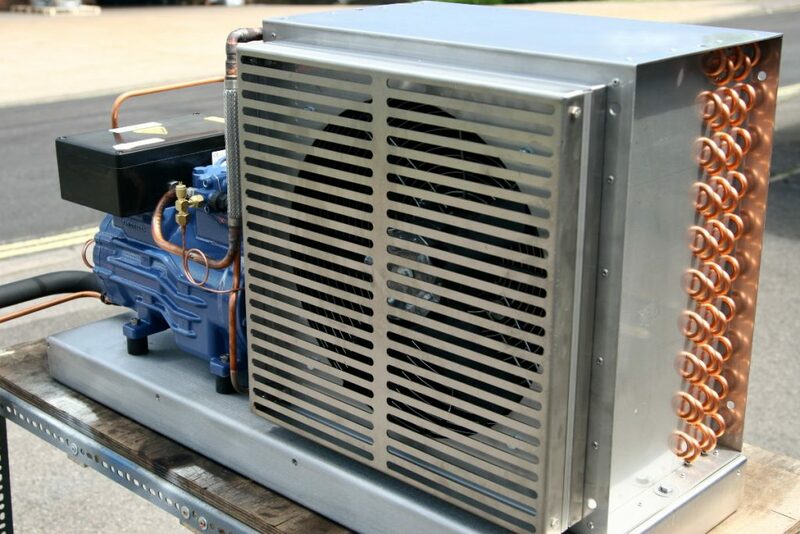 Southern Sales & Services Ltd have a long-standing background in custom condensing unit design. 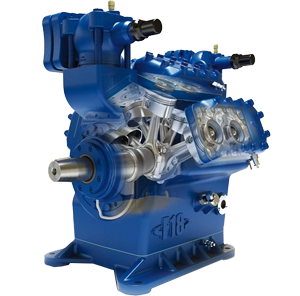 Technical manager Jules Freeman, understands the importance of balancing design parameters in order to achieve the perfect blend of performance, reliability, longevity, and economy. 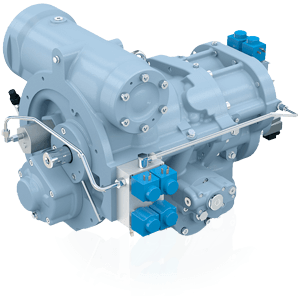 Using the GEA Bock product, ensures the best possible quality available in today’s compression products, and the vast range of variants ensures a perfect match in most cases, whether safe zone, or, ATEX zone 1-2 applications. 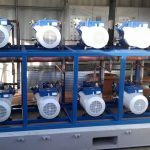 We are then able to determine the most suitable enclosure for the system, in terms of footprint, corrosion resistance, and long term durability. 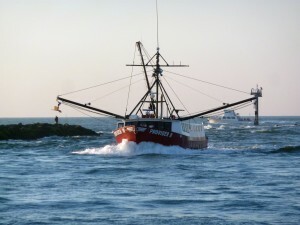 If ultimate corrosion is required for critical corrosion resistant applications, we offer a special two pack epoxy offshore coded package, that will meet the most stringent requirements. If budget is an issue, we are able to provide solutions that will offer the best compromise to cost ratio. 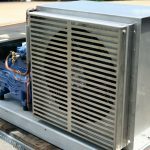 Refrigeration systems will always benefit from PLC / SCADA control, and the extra cost of a sophisticated control system will pay dividends in performance, economy, and reliability in the long term. Be sure to look at our case studies, which are living proof of the quality we strive for. 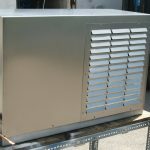 There are many OEM brands / variants of evaporating units (coolers) available on the market today. 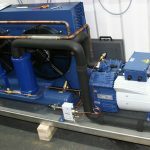 For a cold room installation, selecting a good quality brand such as Searle or Kobol, can be wholly adequate for most applications. 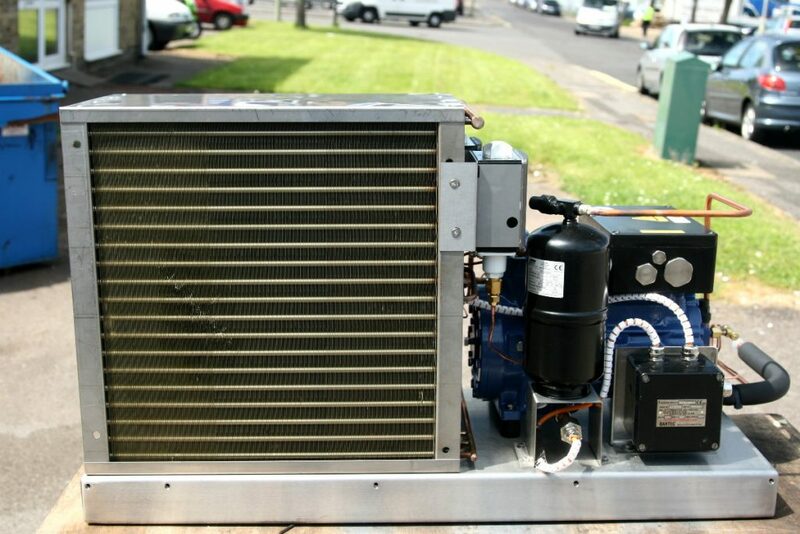 However, this is not always the case for AHU’s, and can become especially difficult where ATEX is a requirement. 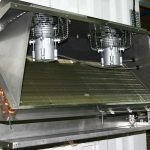 Southern Sales & Services Ltd have an extensive background in building custom, bespoke evaporators, and AHU’s, mainly for ATEX applications, where an off the shelf OEM product just wont meet the specifications of the application. 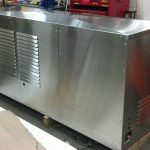 We have found that using high quality marine grade 316 Stainless steel is not significantly more costly than using powder coated aluminium, and 316 S/S is our first choice for our manufactured bespoke units. 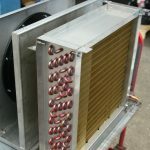 Of course, the cooler is only as good as the selected evaporator core, and we only use high quality cores clad with 316 S/S to match the performance of the outer shell casing. 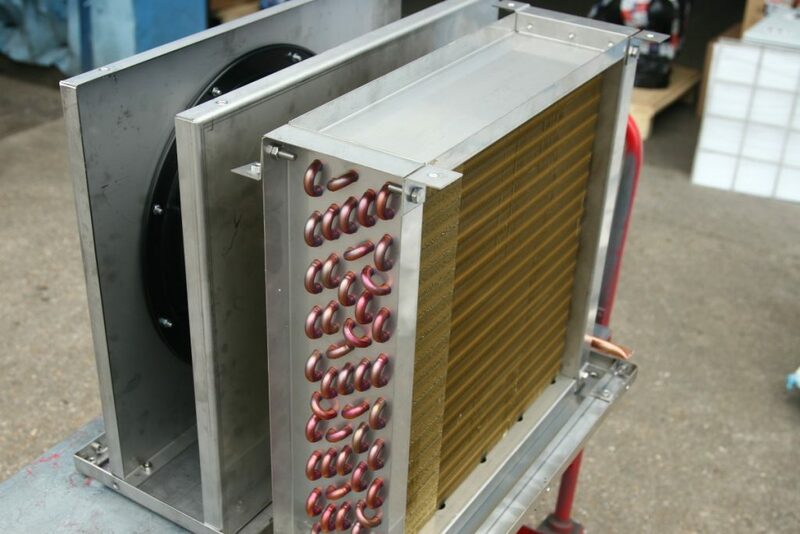 If further corrosion resistance is required, then we can offer, copper / copper coils, and further still, coils that are coated with a special food grade anti corrosion package for the most aggressive environments. 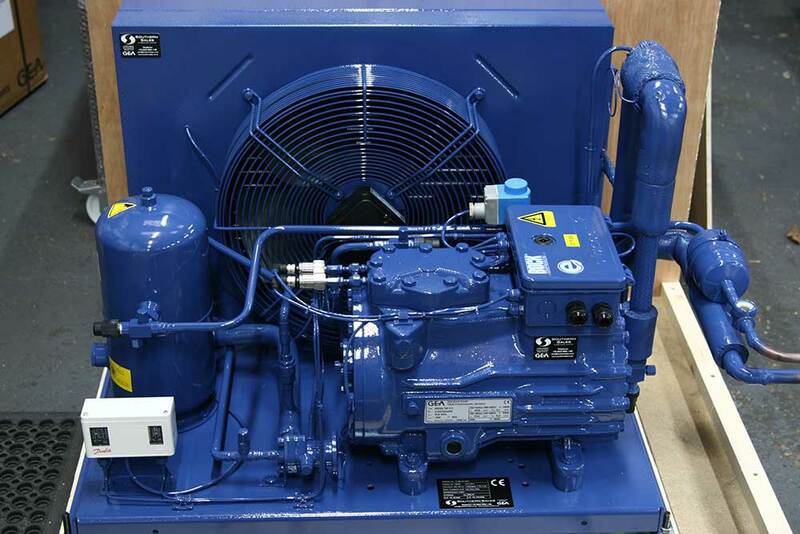 Fan motors can be offered as safe zone and ATEX rated, also low voltage options for marine applications are available. Please review our case studies. 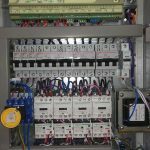 These are actual applications that we have designed and built, and have been operating in a real commercial environment, some for many years. By looking at the synopsis, and then reviewing the design solution, you should get a feel for our design process, and how we overcome the many problems presented with each project. 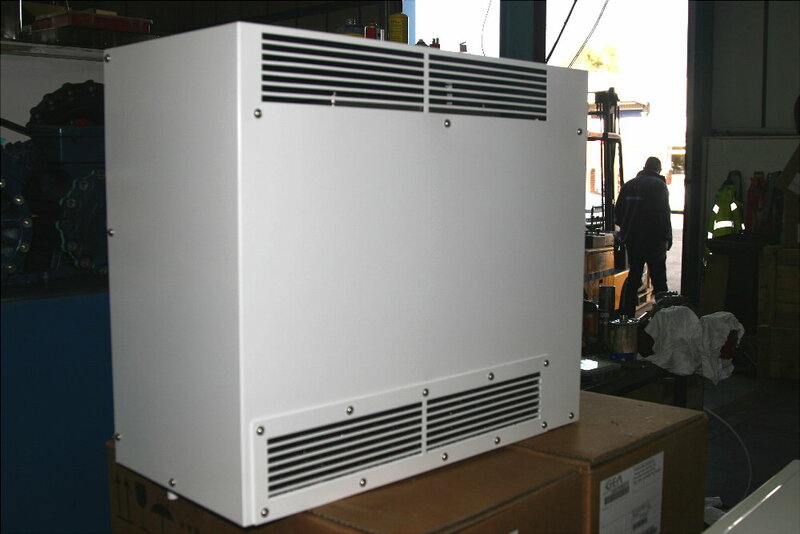 Southern Sales were approached by Excalibur energy, to design a 260kW pack unit for their customer. Evaporating at –31 deg C, condensing at 40 deg C (Low (tc) due to LPA) along with some pretty tight COP requirements it was to be a fairly challenging project. 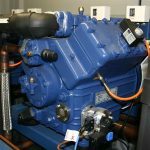 The customer was running a pair of old Grasso reciprocating piston compressors, and the brief was for a proven and guaranteed energy reduction, in order to make the outlay worthwhile. 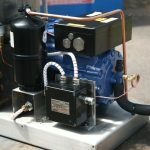 Excalibur specialise in energy efficiency, and had already planned to integrate liquid pump amplification into the system. 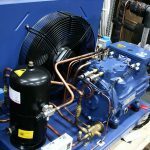 They were keen to use a refrigerant that could offer the best longevity without compromising performance and R417F was duly selected. 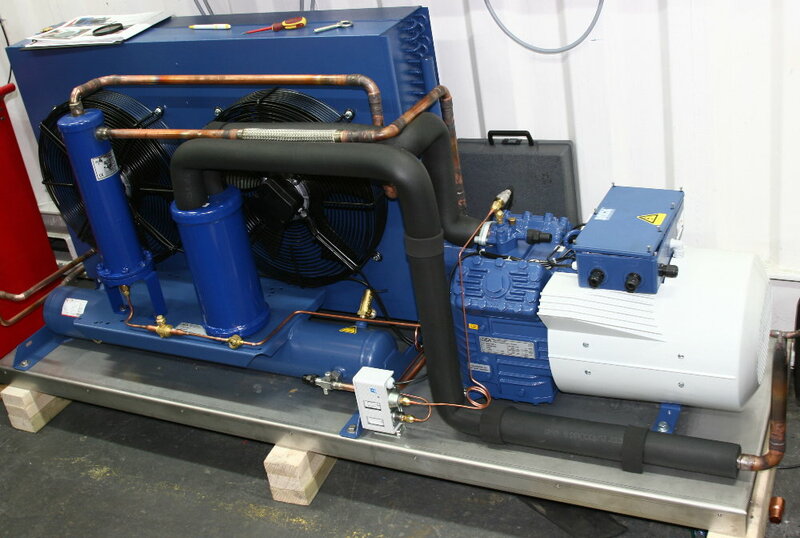 Technical Manager Jules Freeman got to work selecting the best performance compressor for the job. 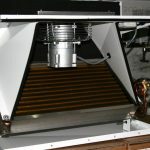 The GEA Bock HAX6/1410-4 provided the best possible COP for this low evaporating temperature. 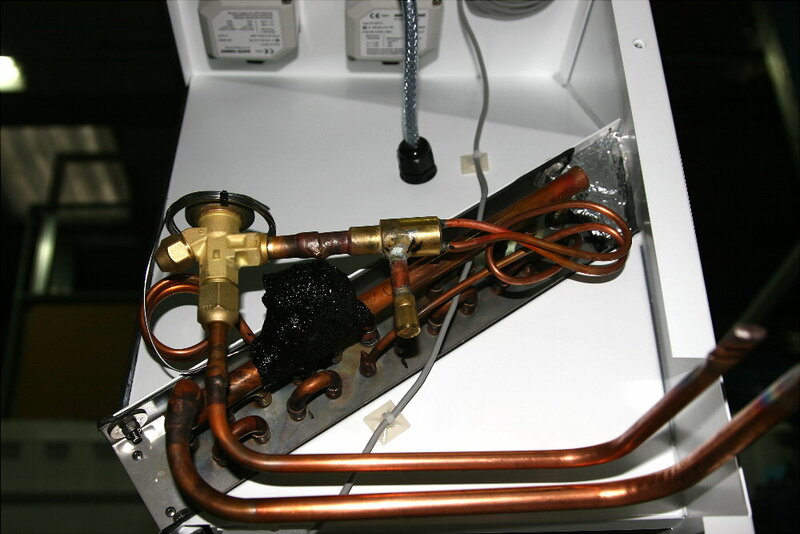 While the LPA systrem reduced the effective condensing temperature (tc) to just 40 deg C. This allowed for a COP of 1.62:1 considered excellent for the evaporating temperature required. 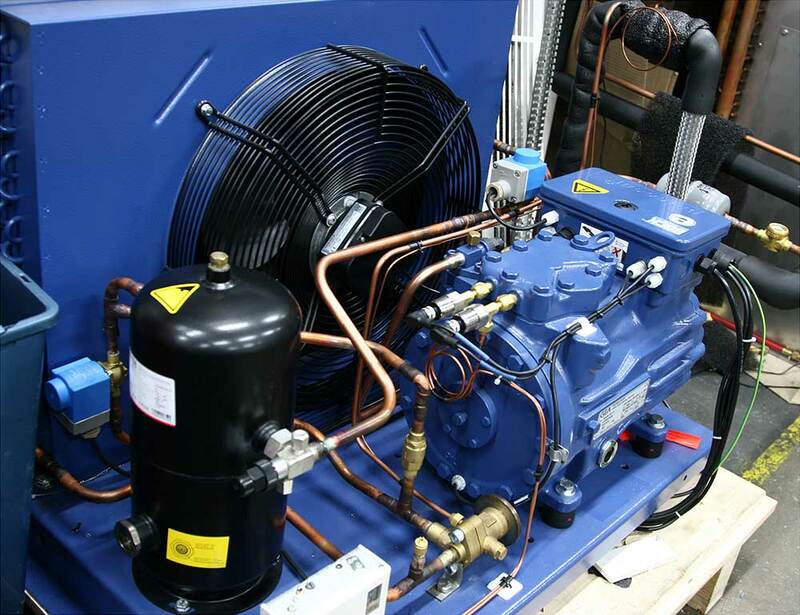 Each compressor would produce 26.8 kW of refrigeration duty for 16.5 kW of consumed power. 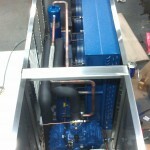 The pack was designed around 10 off HAX6/1410-4 units pack mounted 5 top, 5 bottom, producing 260kW of refrigeration duty. 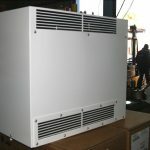 The next problem was that the customer required the whole assembly to fit into an ISO STD 20’ shipping container that would act as the plant room for the completed system. 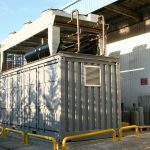 By careful layout planning on a CAD package, we were able to accommodate the 10 compressor pack, the PLC control panels, and the condenser assembly, which was roof mounted onto the container at the customers site. 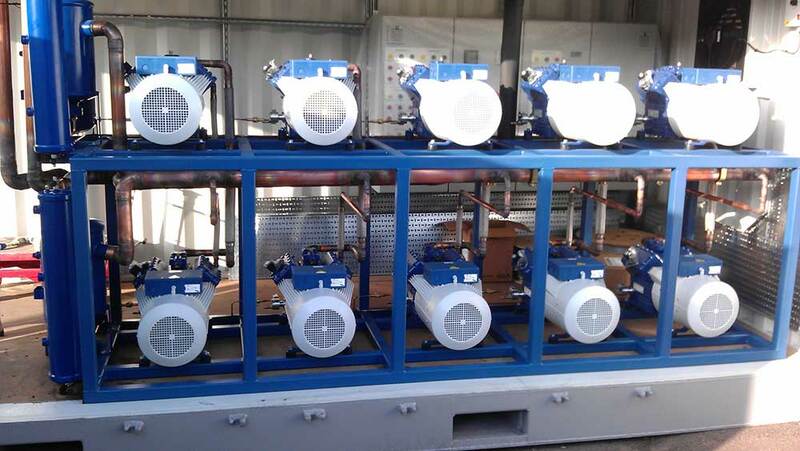 Using carefully designed headers we were able to complete the system, fitting out the pack with large accumulators, oil separators, and oil reservoirs. 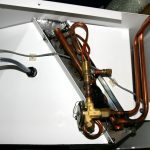 The system was piped as a two part split system, fitting snugly into the given area, but with still enough access for servicing, including the ability to change out a compressor if required. 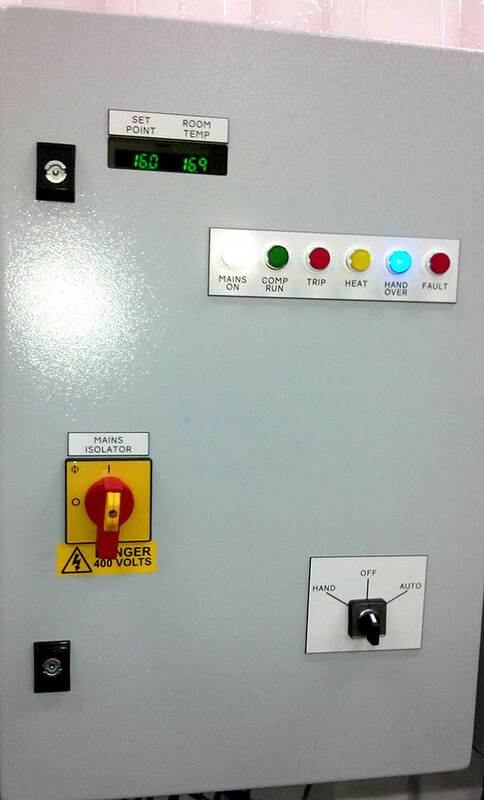 The completed system is controlled by a custom panel built by Excalibur, powered by an RDM pack controller. The system is managed by an RDM data manager panel. 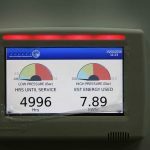 The system has been in service since July 2015, has met the criteria for energy efficiency, and has run reliably. 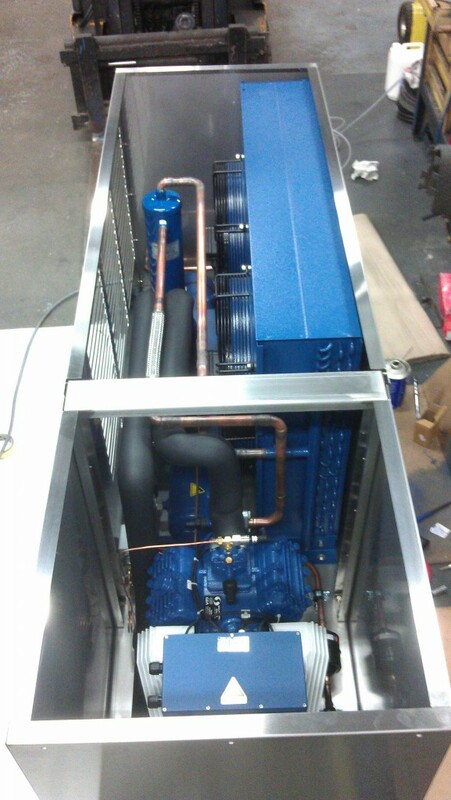 Southern Sales, were approached by a third party company to build a wind farm battery room cooling / heating plant. 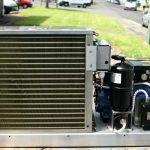 The criteria called for a heat pump system that could heat or cool, in order to maintain the battery room customers required set point temperature. Due to the room holding battery packs, and the potential for Hydrogen release, the room was coded ATEX Zone II 2G 2C T4. 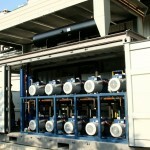 This application would require custom air handling units, as no off the shelf solutions were available. 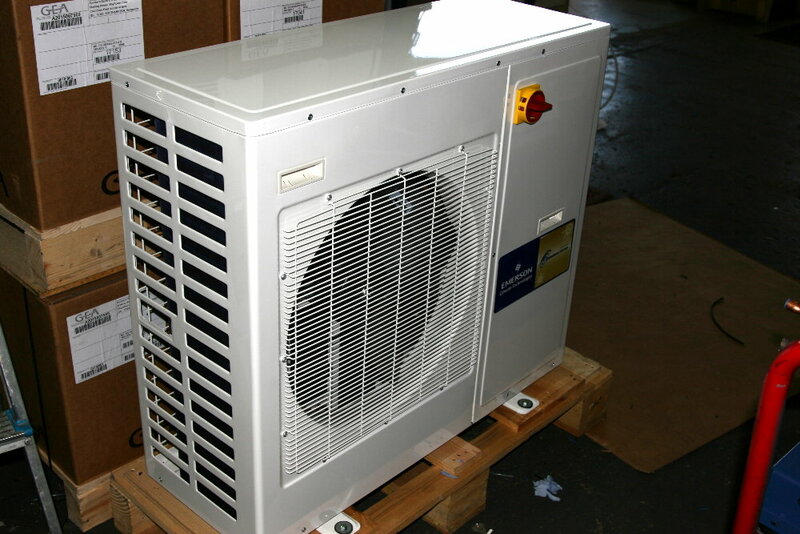 The heat pump system was based on SHGX22P/125-4 S offering 8.23kW duty (cooling mode) to meet the 8.0kW requirement. COP came in at 3.05:1 using R407C as the refrigerant. 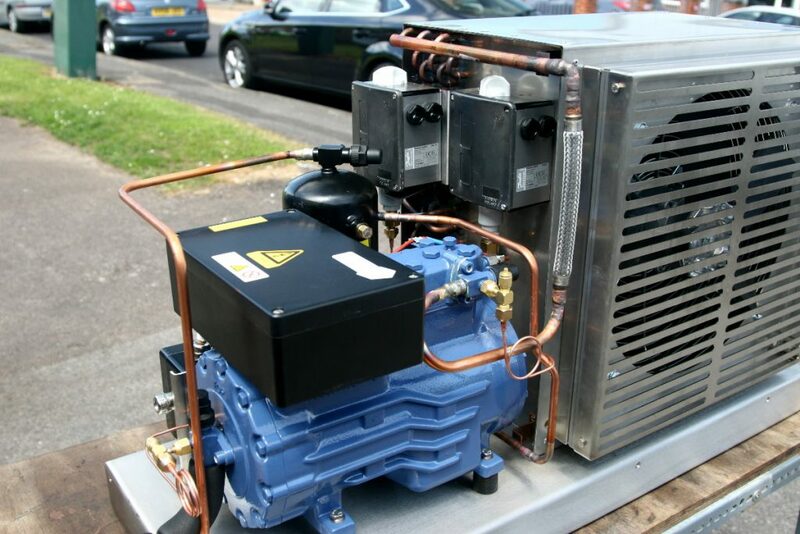 The stock condensing unit was converted to heat pump operation using mechanical TEV’s, and by replacing the stock receiver tanks for a tank with double dip liquid tubes. 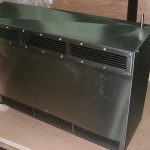 The complete outdoor units were finished in our two pack epoxy off shore anti corrosion package for ultimate protection. 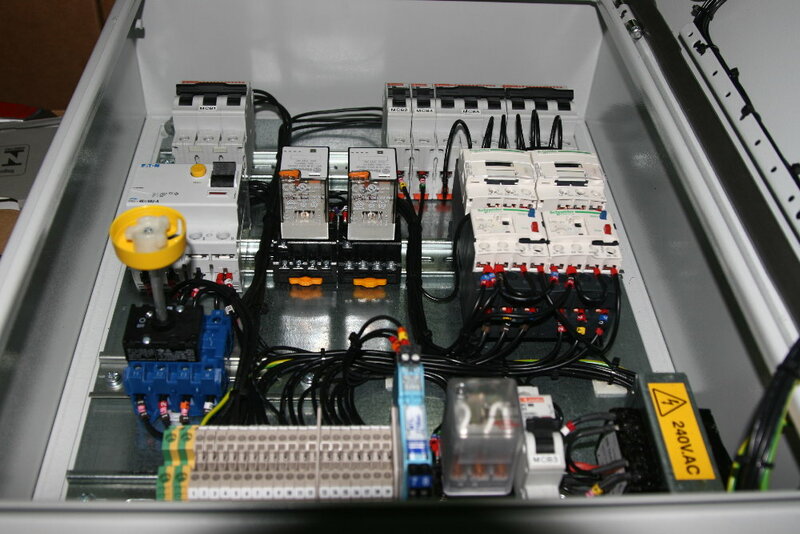 The system design specification called for PLC control, and the units would be run in pairs, using a PLC software “run / standby” dual redundant control system. 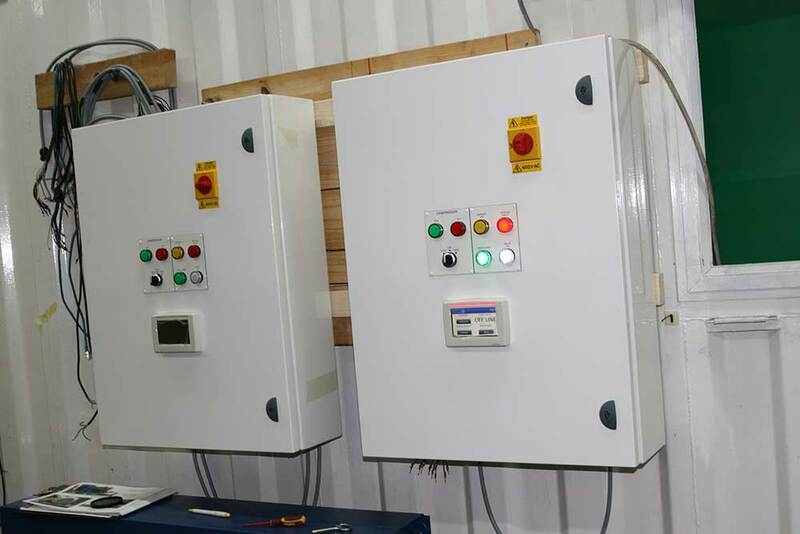 The software was designed in-house, to incorporate “fuzzy logic” fault scanning, so that the running (duty) plant is being continuously interrogated for possible fault scenarios. 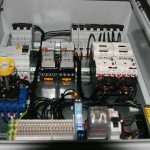 If the control system detects a potential fault scenario, it will shut down the running plant, start the standby plant, and report the fault issue to the sites main BMS system, using BACnet protocol. The actual system is capable of generating emails describing the fault, sent to a technician or pre-configured email recipient list. However, the email reporting system was not required for this application, as the sites main BMS handled these duties. 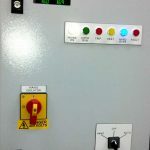 All faults and plant status could be monitored and controlled remotely, as well as being mimicked on the main system control panel in the plant room. 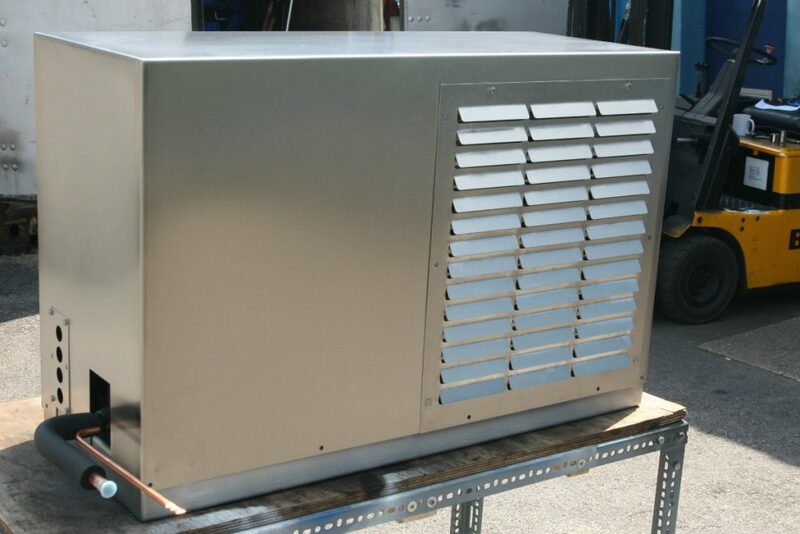 The AHU’s were custom designed in-house and manufactured from 316 Stainless steel. 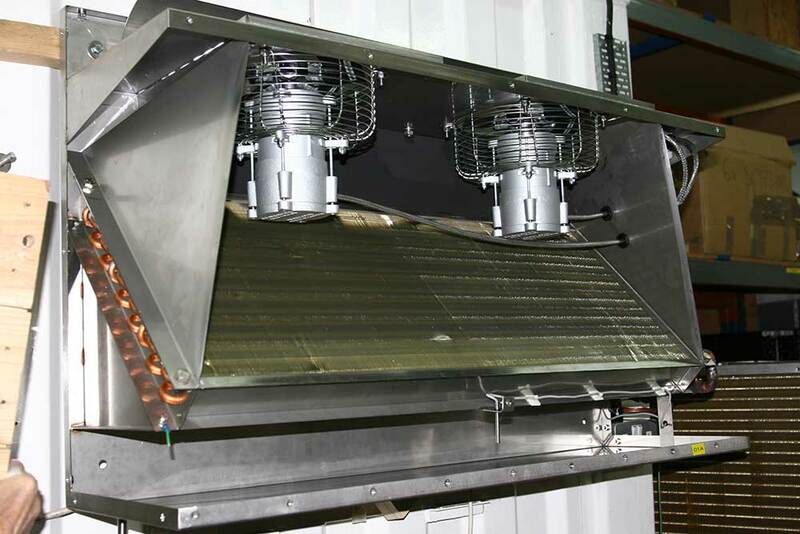 The custom heating / cooling coils were fitted along with two ATEX rated fan motors. 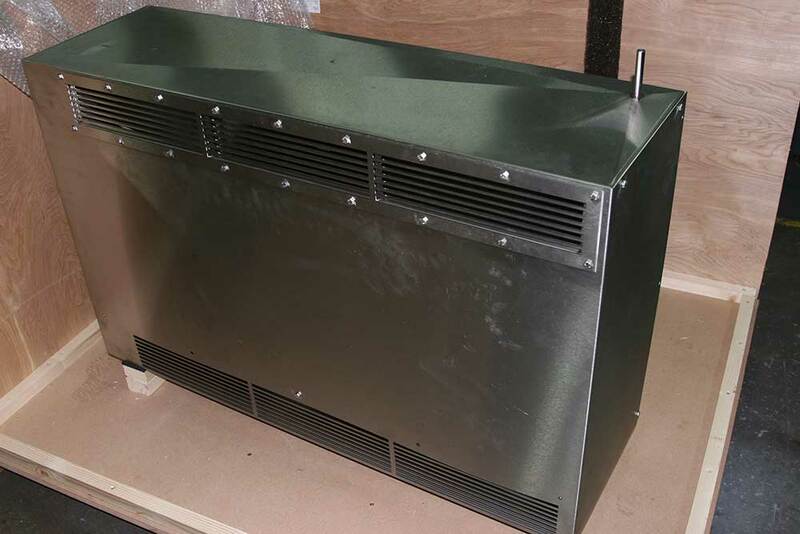 We were very keen to develop a slim line wall mounted unit that kept a fairly low profile, and a lot of design work went into producing the finished component. 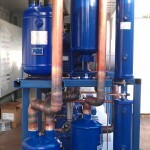 The finished units were individually FAT tested and produced very impressive heating / cooling duties. 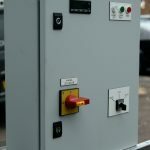 The control system worked flawlessly, the finished units were delivered to the Flintshire Bridge, and Huntingston wind farm sites for installation by Effective Air Services. 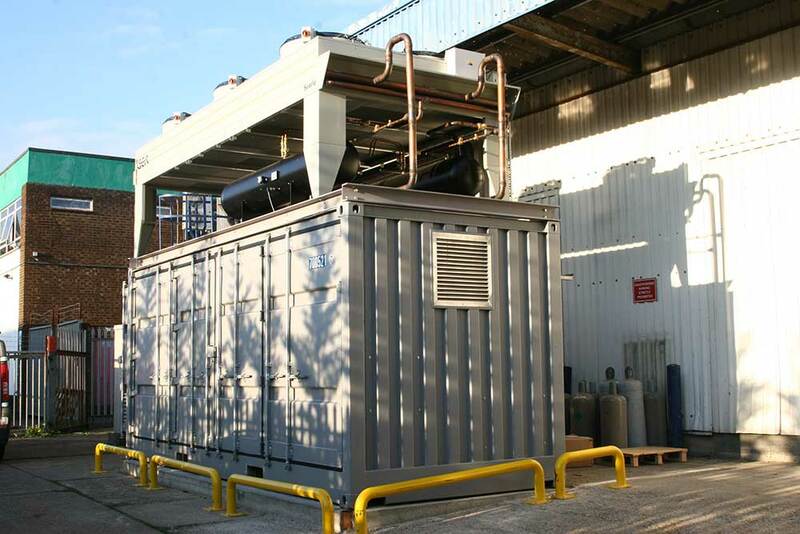 Southern Sales were approached to design and build, a small ATEX Zone 1, ducted ACU for an offshore application. 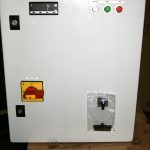 The designed unit consisted of a 316 stainless steel housed ATEX condensing unit, a very compact ATEX rated ducted FCU, and a small safe zone control panel. The main criteria here, was space. 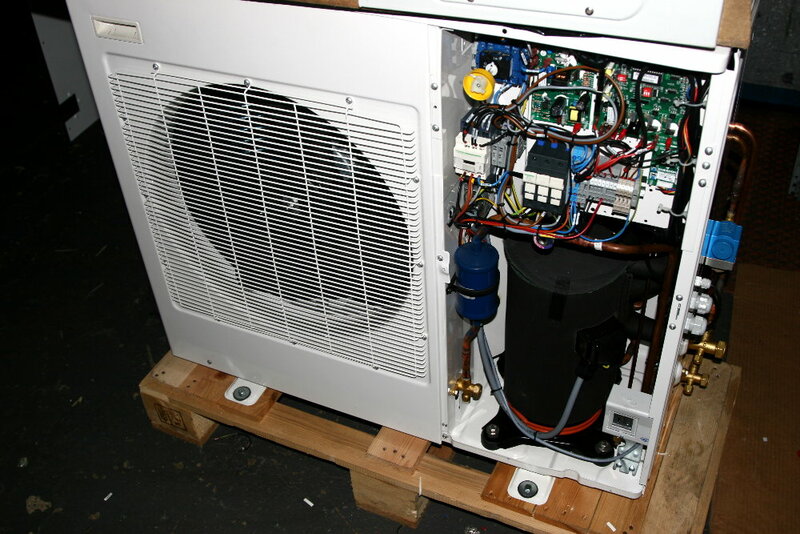 It was necessary to design the layout of the condensing unit, and FCU so as it would fit into the provided area. 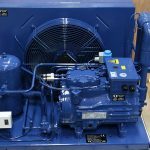 The required duty was just 5.0kW and the selected compressor was the EX-HGX12/110-4S Running on R134a. We were able to achieve 5.13 kW with a COP of 3.13:1. 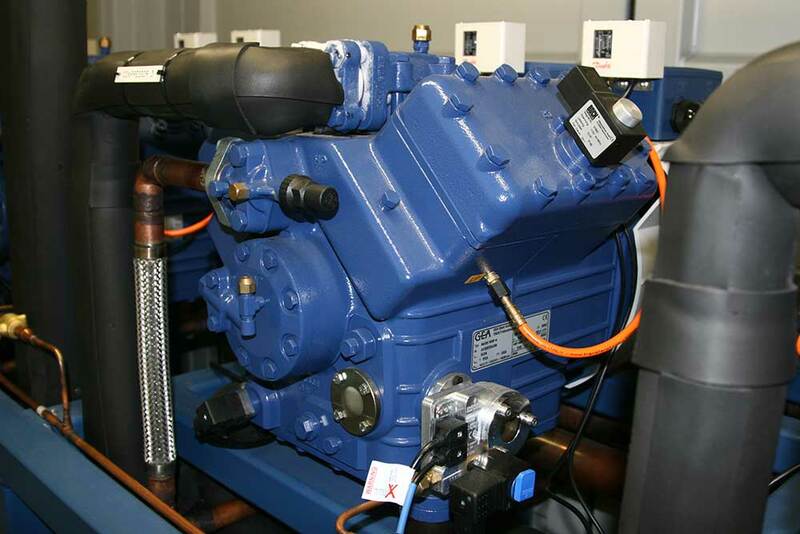 This unit required the fitting of an ATEX rated crankcase heater, to prevent liquid build up in the compressor during shut down periods in the North Sea environment. 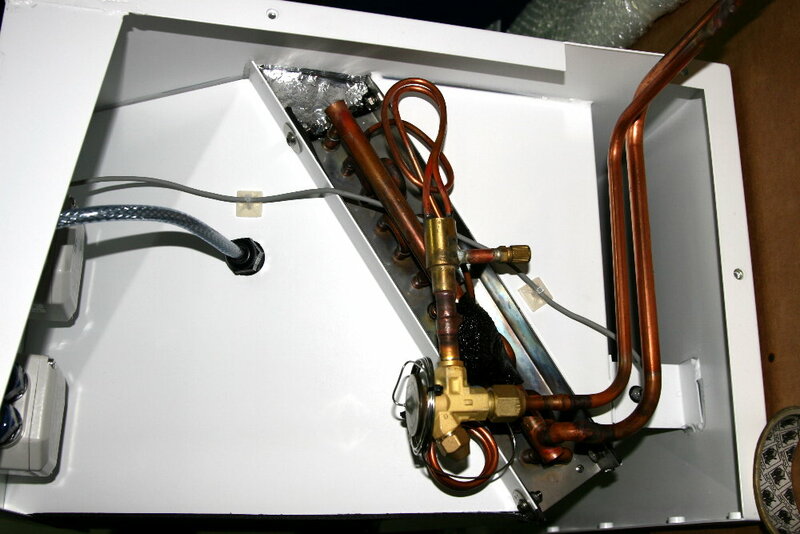 The FCU was of ducted design and incorporated an internal ATEX rated fan. The control panel was safe zone, electromechanical with electronic thermostat. 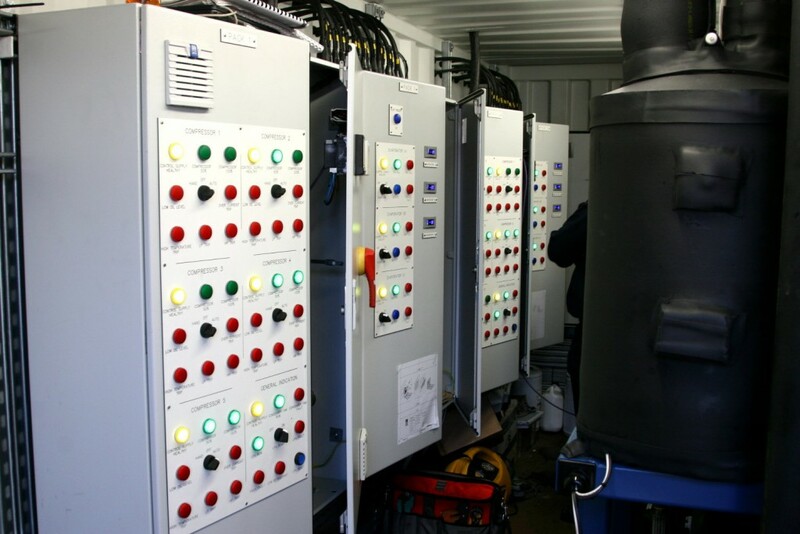 The completed system was delivered to the customer for installation on an North Sea platform. 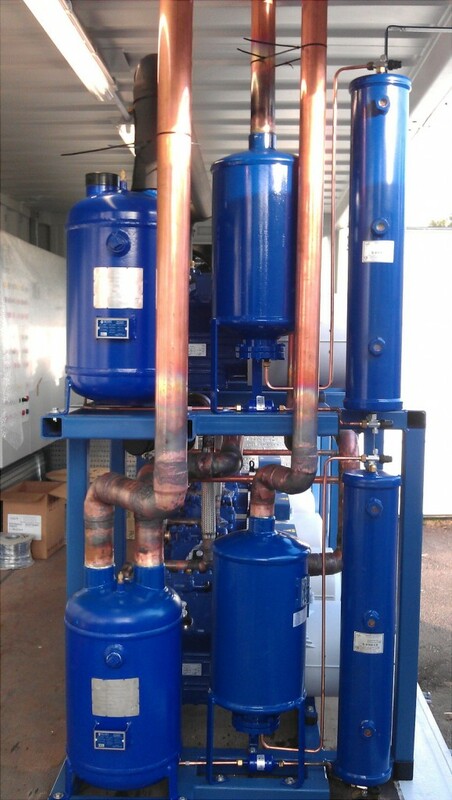 Southern Sales were approached by a third party customer, to design and build a small ACU plant, to cool a Hydrogen balloon filling room. 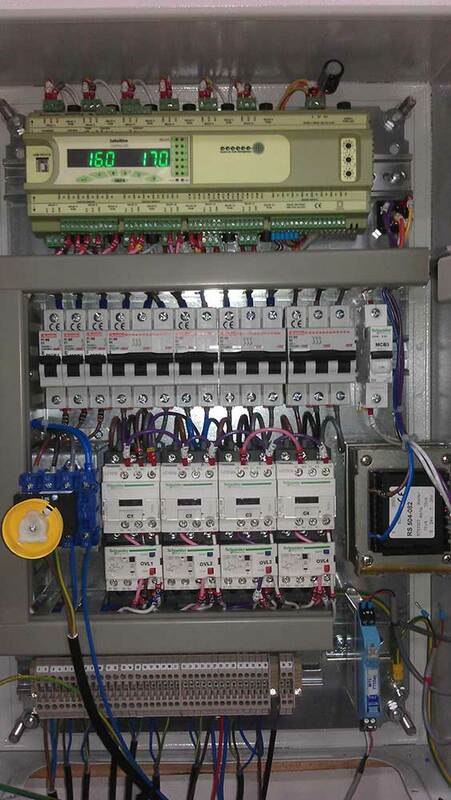 This was to be a ATEX Zone 2 FCU, with safe zone outdoor unit. 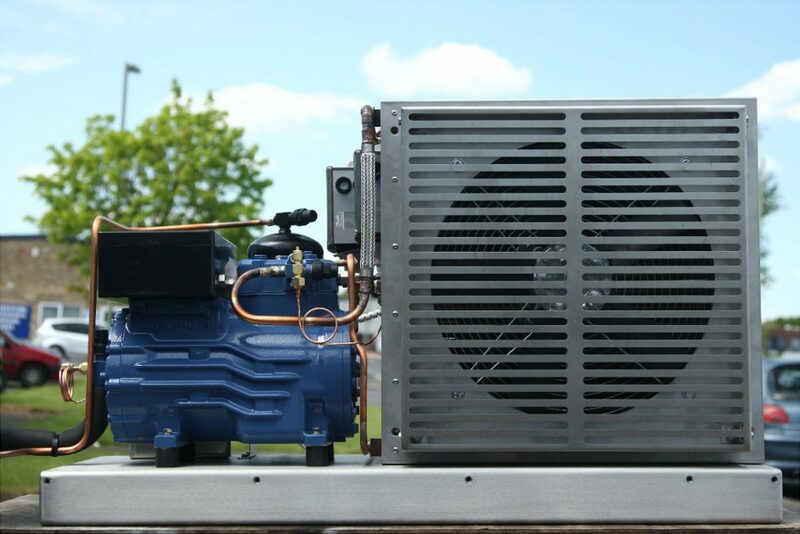 The customer specification called for a scroll compressor, so an Emerson Easy-cool outdoor unit was selected for the condensing unit meeting the requirement for the 3.5kW cooling only duty. 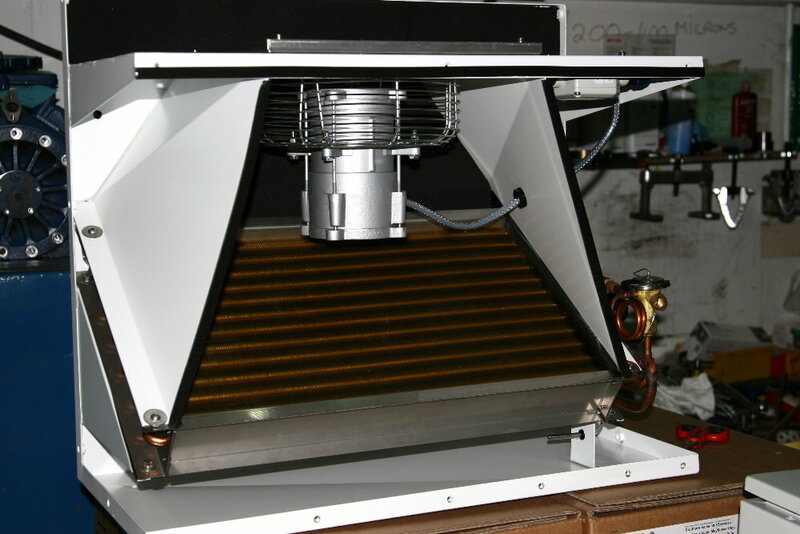 The fan coil was a light-weight alloy powder coated wall mounted with zone ATEX II 2G 2C incorporated a single ATEX rated axial fan. 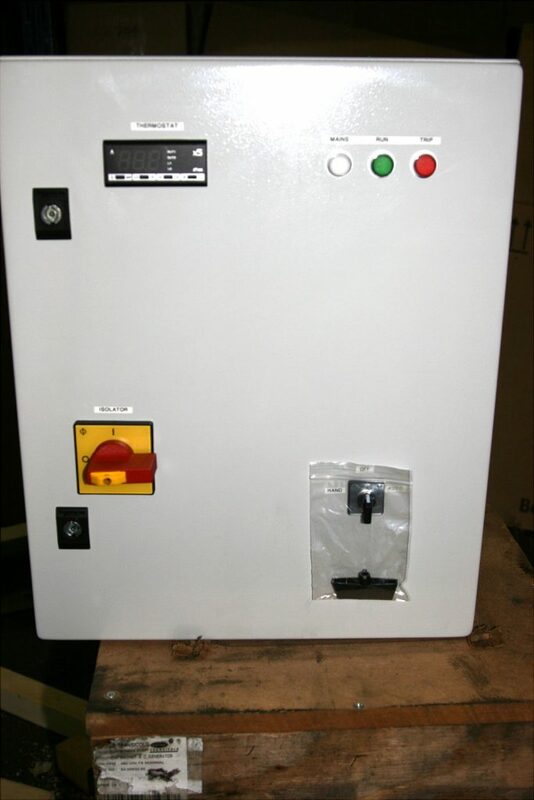 The electromechanical control panel, was designed for safe zone mounting, and incorporated an electronic digital thermostat. 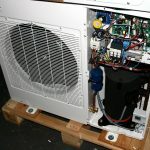 The completed tested system was delivered to the customer for installation. 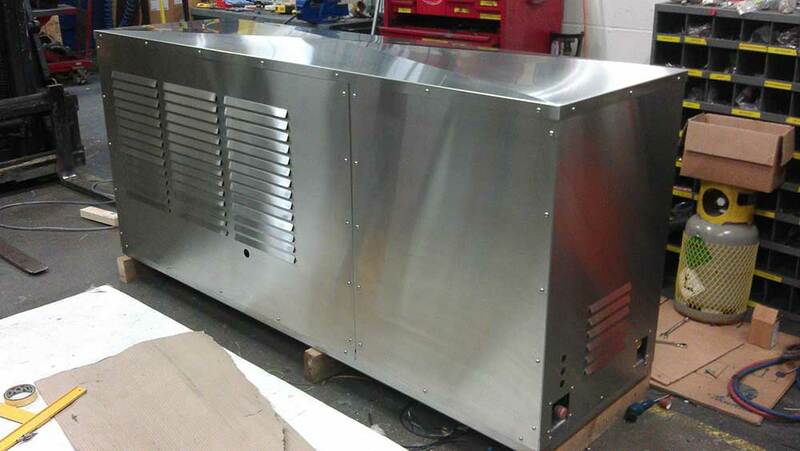 Southern Sales, were approached by Kryos Cooling, to design and build a custom condensing unit for a large freezer application. This would be a dual plant, run / standby, fully redundant system with “boost” mode. The system would be fully PLC controlled, with fuzzy logic fault analysis, email reporting, and remote monitoring / control via IP. The software was written in house, the system was capable of detecting faults, shutting down the duty plant, and handing over duty to the standby plant. 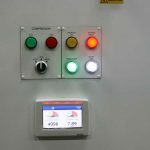 The system will then send an email to the technician (or list of pre programmed recipients) advising of the fault, as well as activating an alarm status on the local HMI control panel. This is a fully integrated, self-managing system with remote control, monitoring, and status reporting. 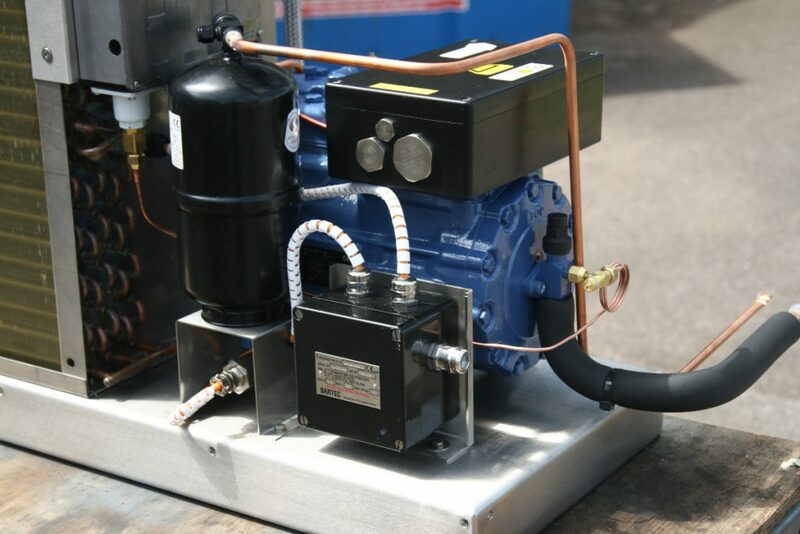 The boost function allows both plants to run full duty, in the event of particularly high loads, such as, at peak times during unusually hot summer months. 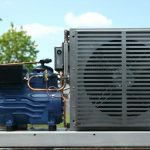 By allowing the system to run at 50% during low load times, but have the ability to run 100% on the rare occasions required, the energy savings are very large. 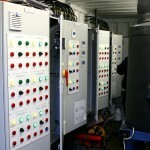 There is also the benefit of having a dual redundant run / standby system which is wholly effective over 90% of the year. 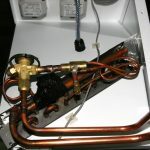 This makes the system extremely cost effective to the end user. 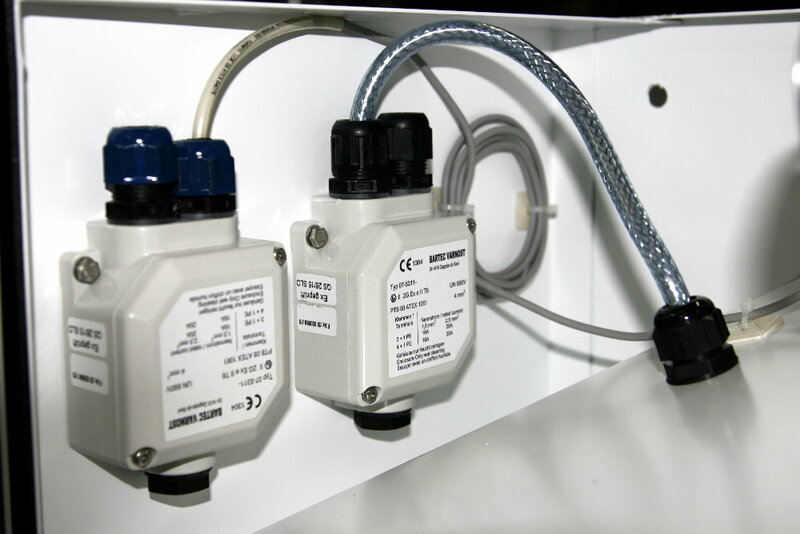 These units used individual evaporating units fitted with Emerson / Alco Electronic expansion valves. The software to drive the valves was custom written in house at SSS along with the main control software. 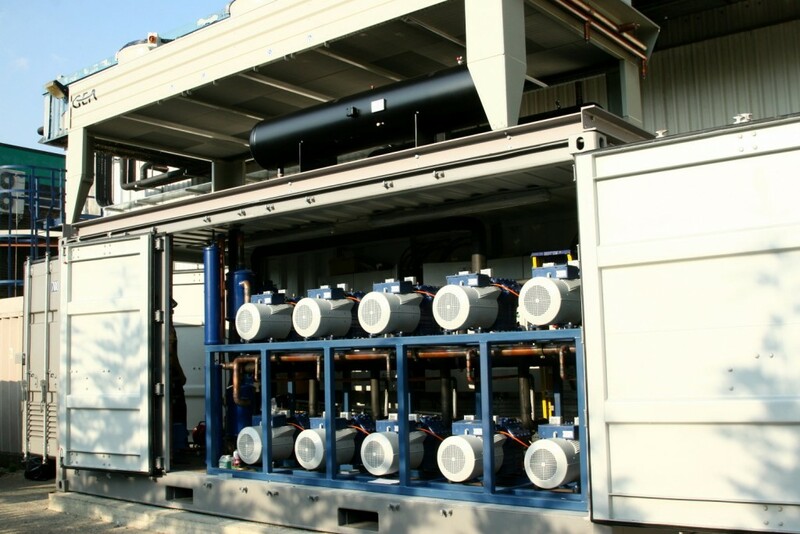 The beauty of the EEV, is that the target superheat can be set, the system will then use PID (Proportional, Integrative, Derivative) algorithms to maintain correct superheat under any conditions. The PID algorithm will, over a short time, learn the modulation steps required, in order to maintain superheat to within 0.1 Kelvin. 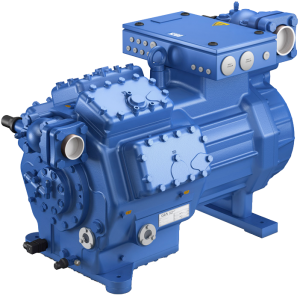 This method of control improves efficiency of the system, as well as reducing stresses on the compressor. 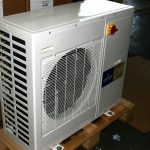 The main criteria for the condensing units were that they should be slim line. The customers premises had a void behind the building that was very long, but not very wide. 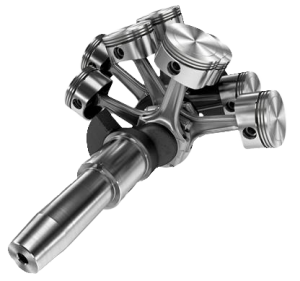 Our solution was to use the GEA Bock SHAX4/555-4 but to re-configure the SHAX components into a 316 Stainless steel housing and chassis bed. This was then clad with a 316 S/S cover. 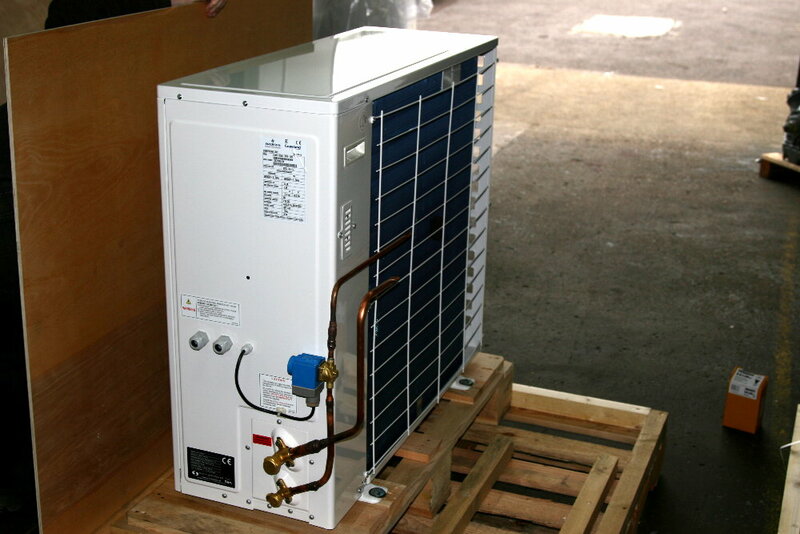 The finished units made 12.6 kW each at a staggering 1.76:1 COP. This was while evaporation @ -24 degC and condensing @ 44 deg C.
The systems also housed a generously large suction line accumulator and oil separator. 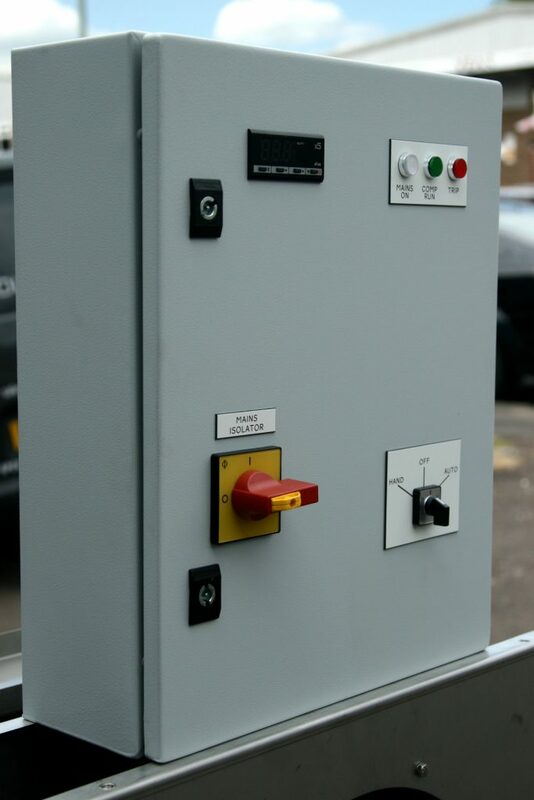 The system was installed at the customers premises in Manchester and has been very well received.